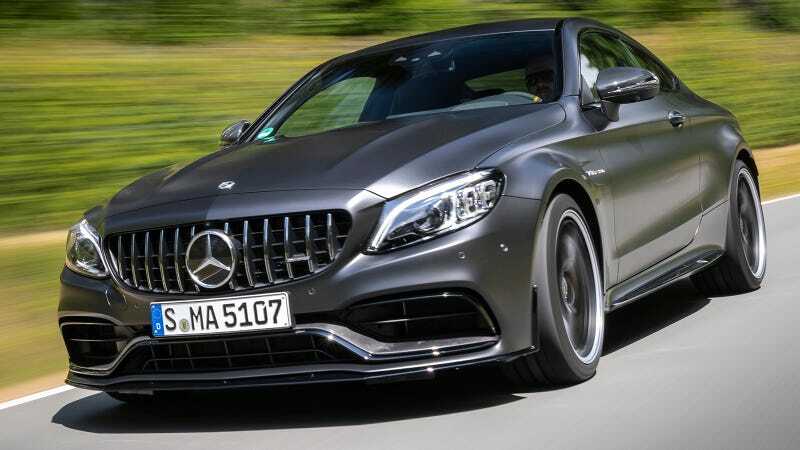 It’s mid-cycle refresh time for the Mercedes-AMG C63, and that means there’s a new face, a new transmission and new driving modes for the up-to-503 horsepower V8 Muscledes-Benz. Let’s start with the important bits: the 4.0-liter twin-turbo V8 is unchanged, and makes 469 horsepower in basic AMG C63 guise or 503 ponies if you go with the AMG C63S. Both trims an be had as either a convertible, a wagon (in Europe), a sedan or a coupe. There’s no indication that the long-roof variant will be coming to the U.S. this time, but that’s never stopped us from hoping before. But what’s not unchanged is the old “Speedshift MCT” seven-speed automatic transmission, as it’s been swapped out for an AMG “Speedshift MCT 9G,” a nine-speed that, like the seven-speed before it, uses a wet “start-off clutch” in place of a torque converter. This, Mercedes says, “allows faster bursts of speed and more spontaneous responses,” and also saves weight. Also fresh for 2019 is a new electronically controlled limited slip differential, standard on all models. Plus, there have also been some changes to AMG Dynamic Select, which changes drive modes by altering engine, transmission, steering and suspension response as well as exhaust sound. There will now be a “slippery” mode for wet conditions, plus there’s a new “integrated dynamic handling control system” called AMG Dynamics. The most obvious change is the tweaked styling, which brings new chrome grille trim and new front outer air inlets. Other changes include new trim inside the car and on the rear fascia. Apparently the tailpipe trim is new. The car looked good before, and now it continues to look good. So, props to Mercedes for not messing it up, I guess.